MagicPerm have been doing a helluva good job on their residency, and if you tuned in this Tuesday you’ll know that this week was no exception. 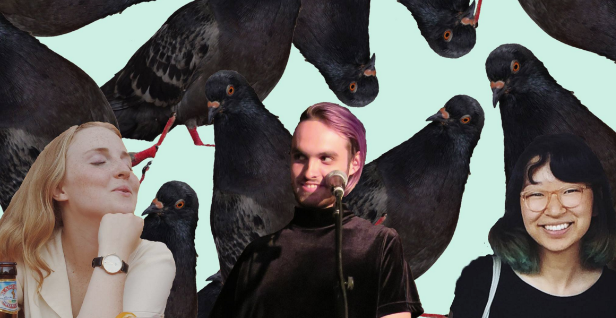 For the uninformed, MagicPerm are a MTL based trio composed of Adam Finley,Sydney Lee, and Rachel Nam who deliver a range of alt/synth pop/dream sounds for all to enjoy. And lucky for us, they’ve agreed to host the Montreal Sessions for the month of January! This weeks episode comprised of a hilariously deadpan monologue about a pigeons prophecy, some interactive listener games, a wide selection of delightful Canadian music, and the talented Alexia Avina featured in the studio for a live acoustic performance (you can check out her Bandcamp here, it is lovely). What i’m trying to say is that it was a fantastic time and you should defs check out our archives to take a listen to what these guys have been airing! This entry was posted in CKUT programming and tagged Alexia Avina, Canadian, Dream, Games, MagicPerm, Pigeons, Synth Pop on January 14, 2016 by librarian.